Fill your living room with traditional style and grace with this elegant big and tall reclining pressback chair. Lean back and put your feet up and relax as you push on the back and descend into stylish comfort. Rolled, scooped arms play beautifully with the tapered feet and split back for a graceful, traditional elegance. Choose your fabric from over 800 choices till you find the look that is ideal for your home. This chair is also available in leather for added style. 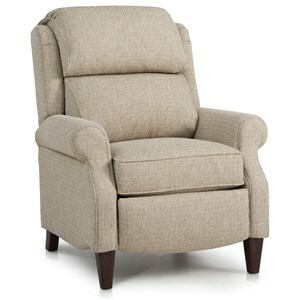 With this comfy chair in your home, you will love enjoying evenings watching TV with this plush chair. The 503 Traditional Big and Tall Pressback Reclining Chair with Rolled Arms by Smith Brothers at Wayside Furniture in the Akron, Cleveland, Canton, Medina, Youngstown, Ohio area. Product availability may vary. Contact us for the most current availability on this product.